Para NB – Sport & Recreation is a provincial program overseen by a management team consisting of Ability NB and the Government of New Brunswick. The Para NB – Sport & Recreation program involves working with persons with a physical disability, schools, Provincial Sport Organizations (PSOs), disability organizations, recreation organizations and facilities to build capacity and lead the development and coordination of a system that engages New Brunswickers with physical disabilities in para sport and recreation. To increase access to and involvement in para sport and recreation of persons with a physical disability throughout NB from physical literacy to competition stages of development. To increase the involvement and awareness of sport and recreation organizations in para sport and recreation. To increase the knowledge and awareness of the universal design and operation of recreation and sport facilities. To increase the number of trained and certified coaches and leaders actively working in para sport and recreation. To provide guidance and support to competitive para athletes. To build a sustainable para sport and recreation system in New Brunswick. The successful partnership of the New Brunswick Department of Healthy & Inclusive Communities along with Ability NB has resulted in the development of the Para NB – Sport & Recreation program. Working together is beneficial as these organizations are able to draw on resources and expertise in a complimentary way, share ideas, skills and knowledge and work towards the common goal of leading the development and coordination of a system that engages New Brunswickers with a physical disability in para sport, recreation and active living. 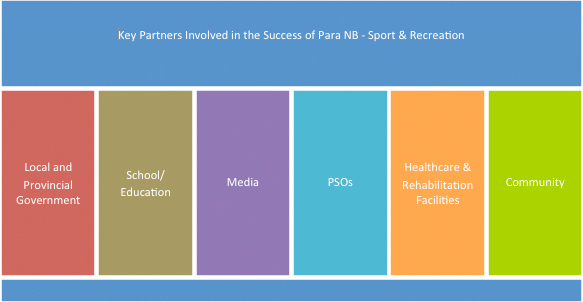 Para NB – Sport & Recreation will continue to strive to strengthen partnerships with recreation and sport organizations, recreation facilities and disability organizations throughout the province. Engagement – We believe that a positive, fun and safe first contact experience with para sport and recreation activities will lead to more active involvement. Engaging persons with a physical disability in para sport and recreation will also lead to more New Bruswickers who are able to enjoy greater health benefits and active involvement in physical activity. Collaboration – We believe that forming and maintaining strong, long-term partnerships with key individuals and organizations will contribute to the success of para sport and recreation programs in New Brunswick. These partnerships will create more opportunities to educate participants and athletes, create more awareness of opportunities to participate, increase capacity of programs and enhance communication within the sport and recreation communities. Leadership & Excellence – We believe that everyone should have the opportunity to compete and pursue personal excellence in recreation and sport and that those who do so are also leaders in the sport community and experts in their field or chosen activity.